Intimate, clandestine, romantic and discrete – private dining rooms for up to ten guests are, by their very nature, small and select. For business, this size of event often means ‘board’ or other ‘off-site’ meetings with a need for AV or VIP dining where the top brass is hosted. For personal events and private dinners, this number of guests will often mark a special occasion with very close friends or family as well as the odd proposal! Small private rooms can now be found in a surprising number of London restaurants. So whether you fancy holding lunch or dinner at a private chef’s table in a Michelin starred restaurant, surrounding your guests with top vintages in a wine cellar or taking up one of the Capital’s many discrete spaces in a private club or hotel, there’s plenty to choose from. So whether you’re hosting a business meeting or celebration with friends, we’ve a whole range of options to suit any type of event. Top Tip: To make an intimate dinner even more special try a tasting menu or menu gastronomique – Not everyone will like everything, but that’s why it always makes a great talking point! 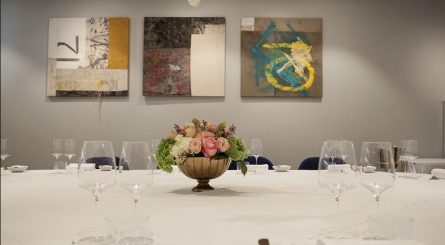 The private dining room at Michelin starred Pied à Terre restaurant in Fitzrovia seats up to 16 guests. The private bar can accommodate up to 25 guests for standing drinks receptions and the main restaurant is available for exclusive takeover for up to 40 seated guests. 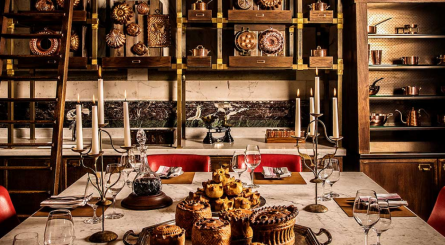 A kitchen by day and an exclusive dining room by night, The Pie Room at Holborn Dining Room is possibly London’s most celebrated private dining venue dedicated to serving pies and seats up to 10 guests. Open for private dinners weekdays and lunch & dinner on Saturdays, Sundays and Bank Holidays. 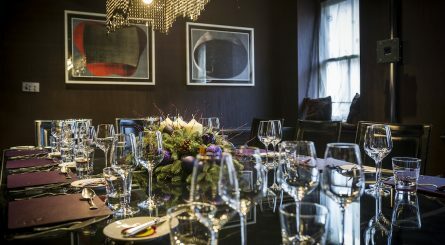 The private dining room at Mayfair fine dining restaurant The Square in Mayfair seats between 8 – 18 guests. 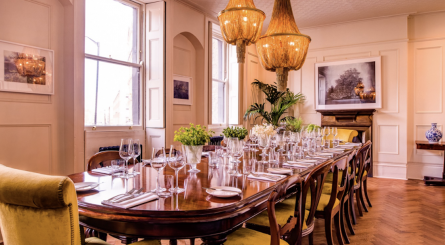 Corrigan’s Mayfair has four elegant private dining rooms including the Chef’s Table seating between 6 to 30 diners. Exclusive hire for up to 85. The three stunning private dining rooms at Alain Ducasse at The Dorchester respectively seat 7, 12 & 30 guests. 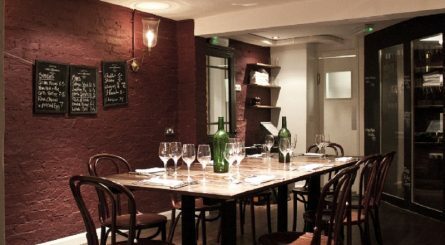 The three first floor private dining room at popular modern Scandinavian restaurant & bar The Harcourt in Marylebone seat between 8 and 20 guests. The Garden Room accommodates up to 60 guests for standing receptions. 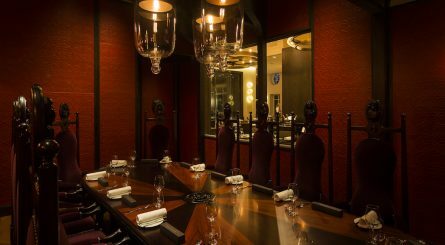 The private dining room at Dinner by Heston Blumenthal seats up to 12 guests and the Chef’s Table seats 4 – 6 guests. 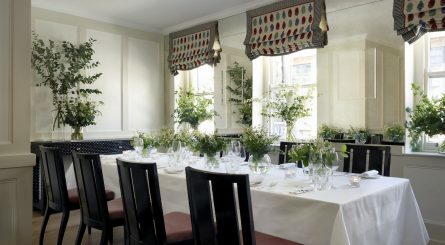 The four private dining rooms at Quo Vadis seat between 9 – 32 guests. 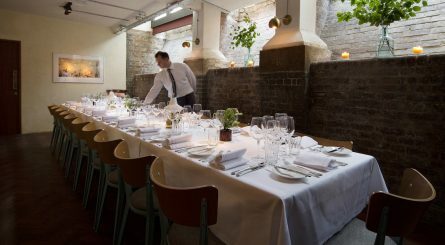 Located in the heart of Shoreditch, Merchants Tavern has two private dining spaces seating up to 10 and 22 guests. Benares, the Michelin starred Indian restaurant in Mayfair has four private dining rooms seating between 10 – 36 guests including a Chef’s Table seating up to 10 guests. 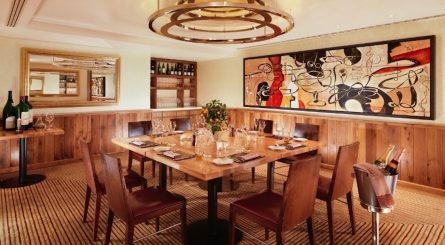 The two private dining rooms at award-winning Bar Boulud in Knightsbridge accommodate up to 24 seated guests or up to 50 when combined. 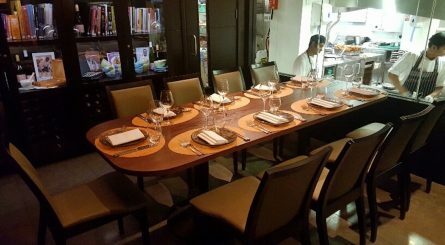 The Chefs Room seats up to 50 private dining guests.